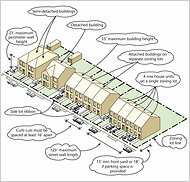 has revamped their 2006 Zoning Handbook, a tool that summarizes and illustrates the 1500-page Zoning Resolution. Not quite Doris Diether when it comes to details, but still, really helpful. You’ll find full coverage in an interview with DCP Commissioner Amanda Burden in the New York Times. It can be purchased for $35 at the planning department bookstore, 22 Reade Street, or by downloading an application at nyc.gov/html/dcp/pdf/pub/orderform.pdf.